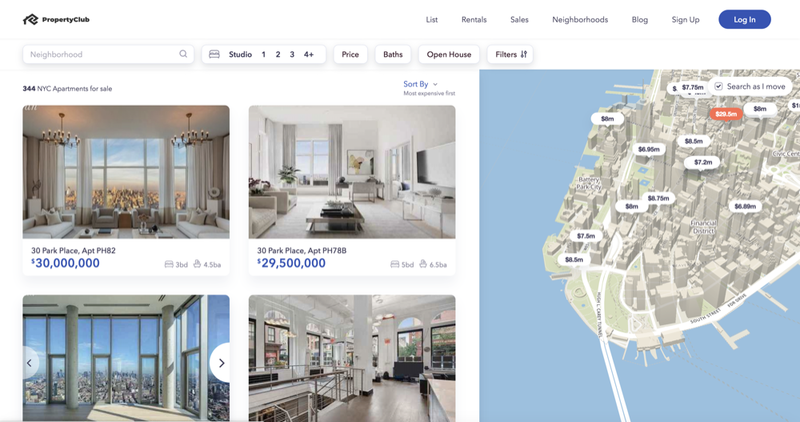 Searches for NYC apartments typically begins online, but a major issue with most of the online real estate listing sites is that you never know if you’re seeing an accurate depiction of the property or getting transparent pricing. Most other sites serve as a data collection platform, masqueraded as a real estate listing site, where your information is sold to third parties for lead generation. So the focus is to get traffic without consideration for the user experience. 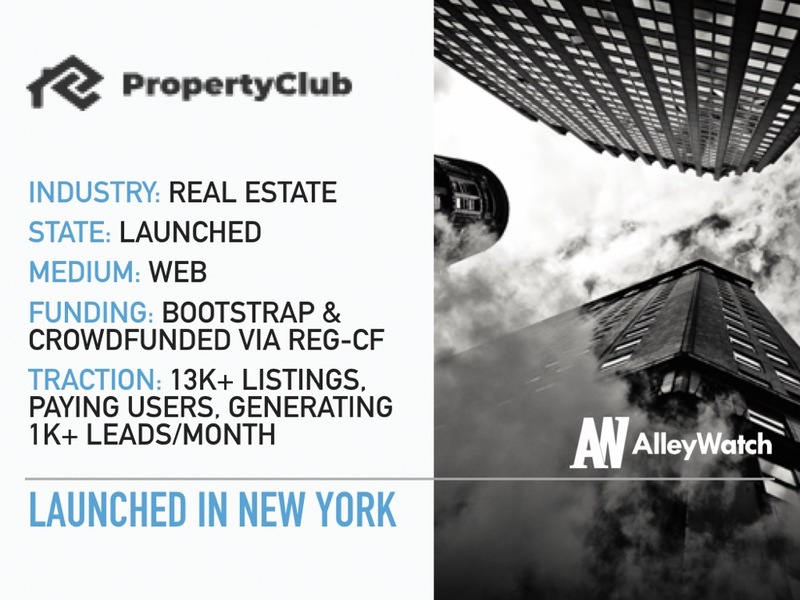 However, NYC startup PropertyClub’s online platform shows direct, verified listings with accurate pricing, while giving consumers the opportunity to earn cash or crypto rewards for use of the platform. PropertyClub pledges never to sell your data. 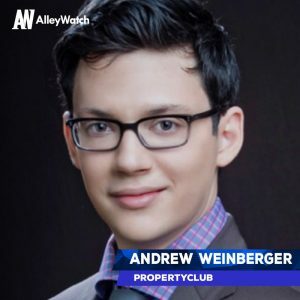 AlleyWatch interviewed founder Andrew Weinberger about creating a high quality, real estate portal built on complete transparency. Tell us about the product or service that PropertyClub offers. PropertyClub is an online real estate marketplace that features the best listings at the best prices. We do this by keeping our marketplace totally transparent while offering users as much choice as possible, including the opportunity to earn cash or crypto rewards. Our value proposition to users is simple. We’ll save them time and money by showcasing verified listings and giving them the opportunity to earn rewards. This is a 180 from what our competitors do as their business models are typically based on introducing third parties and increasing friction. 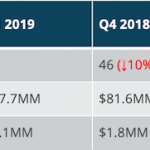 This puts their interests in direct conflict with those of their users and it’s our belief that this is precisely why Zillow Group (the market leader) in our industry, has been unable to achieve profitability. They have approximately 90% of online traffic but have not even been able to get close to 5% of ad spend due to their customers dislike for their model. Our B2C services are also unmatched in price and quality, and unique among major real estate portals. What market does PropertyClub target and how big is it? The US real estate advertising is a $30B dollar a year business, but some of our B2C products can really be classified as brokerage replacement products that would fall under the real estate brokerage business which is a $165B dollar a year business. We have a number of revenue streams at the moment. The core business is subscription-based advertising and we’re proud to say we just recently on-boarded our first enterprise client. We also have some B2C offerings like our “assisted FSBO and assisted FRBO products”. Finally, there’s also the potential for a future SaaS component as out B2B customers typically use third-party CMS/CRM platforms for listing management. We believe this is inefficient and don’t expect those listing distributors to survive long-term. From speaking with a lot of RE industry execs, our impression is that they’d much rather have an end-to-end solution, which we hope to offer in the future. What inspired the start of PropertyClub? 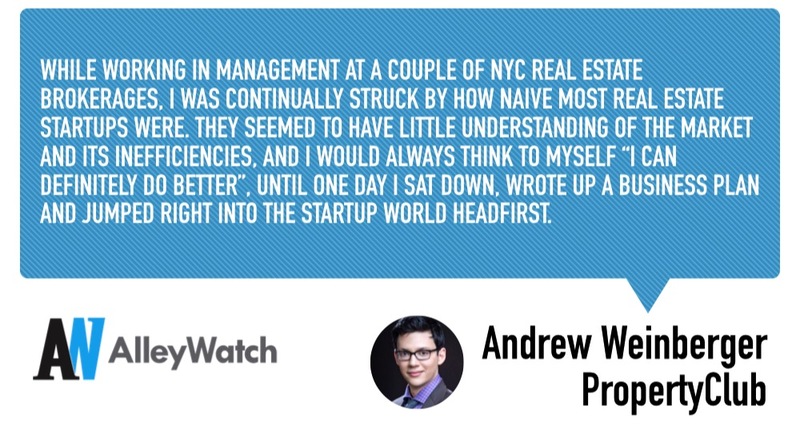 While working in management at a couple of NYC real estate brokerages, I was continually struck by how naive most real estate startups were. 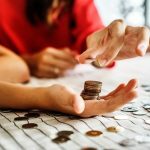 They seemed to have little understanding of the market and its inefficiencies, and I would always think to myself “I can definitely do better”, until one day I sat down, wrote up a business plan and jumped right into the startup world headfirst. I’m a big fan of Julie Wainwright. She’s a bit of a maverick in that she does things her own way. She’s also a fellow solo founder which makes it easy to relate, while also making her achievements all the more impressive. Our 2 main goals for the next 6-9 months are to expand our digital reach, especially our search presence, and hitting profitability. We’ve shifted our focus from scaling nationally and are doubling down on growing our foothold in NYC as we’ve been experiencing great results in recent months. Rather than growing too fast we want to give our users and customers the best possible product and experience possible. Expect & plan for the worst at all times. Make sure you always have a plan B, C, D and so on. Besides the cliche “I’m from here” I think NYC is a great proving ground. As the saying goes if you can make it here you can make it anywhere. Now that’s a tough one as there are so many great options out there, but it has to be Gari 46. It’s one of the only restaurants that I’ll happily make the trudge to midtown for, which is saying something considering they have a much closer location in Tribeca. Also have to give a couple shout-outs to Manhatta, which is just around the corner from my office, and Pisillo, as it’s been my go-to spot for lunch for years.